Kamala Harris: What happened in Charlottesville is un-American. 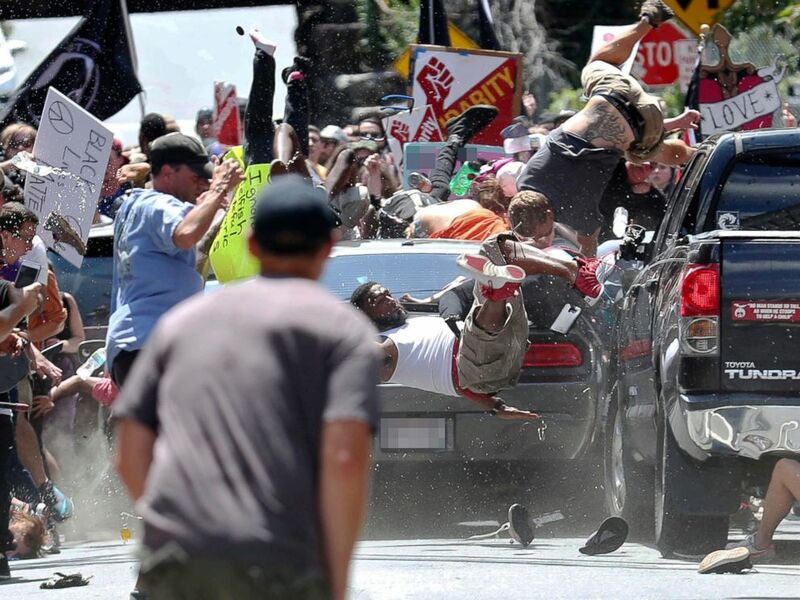 A white supremacists demonstration went violent in Virginia resulting in the death of three people and injuring 19 others after they locked horns with anti-right protesters. The white supremacist demonstration called “Unite the Right” was scheduled to happen in Charlottesville, Virginia when a car plowed into the group of peaceful counter protesters, causing the death of a person. Two Virginia State Patrol troopers were killed when a helicopter assisting people crashed near the protesters. The “Unite the Right” was organized for the removal of Confederate general Robert E Lee’s statue from a park in Charlottesville college park. The unprecedented clash has forced the authorities to declare an emergency in Charlottesville and more police personals have been deployed to handle further riot instances. On Friday, several men and women marched to the University of Virginia’s shouting slogans “You will not replace us,” and “Jew will not replace us.” This small protest, a foreshow of Saturday’s march, also turned violent with one person being lead handcuffed. Mike Signer, the mayor of Charlottesville, on Saturday morning, had called the rally a cowardly parade of hatred, bigotry, racism, and intolerance march down the lawns of the architect of our Bill of Rights. “Today, in 2017, we are instead seeing a cowardly parade of hatred, bigotry, racism, and intolerance march down the lawns of the architect of our Bill of Rights. Everyone has a right under the First Amendment to express their opinion peaceably, so here’s mine: not only as the Mayor of Charlottesville but as a UVA faculty member and alumnus, I am beyond disgusted by this unsanctioned and despicable display of visual intimidation on a college campus,” he added. “Go home. You are not wanted in this great commonwealth. Shame on you. You pretend that you’re Patriots, but you are anything but a patriot,” said Virginia Governor Terry McAuliffe delivers a message to “white supremacists and Nazis” in Charlottesville after violence. President Donald Trump called the incidents on Saturday as “display of hatred”. “We condemn in the strongest possible terms this egregious display of hatred, bigotry, and violence on many sides, on many sides,” Trump told reporters. “It’s been going on for a long time in our country. Not Donald Trump, not Barack Obama, this has been going on for a long, long time. It has no place in America. What is vital now is a swift restoration of law and order and the protection of innocent lives,” he said. “No citizen should ever fear for their safety and security in our society. And no child should ever be afraid to go outside and play or be with their parents and have a good time,” he said. According to the president, who earlier during the day conducted the discussion with Virginia Governor McAuliffe, the protest in Charlottesville was conducted by white nationalists, neo-Nazis, Ku Klux Klan, calling it as one of the biggest right supremacist rallies in decades. He also tweeted condolence message to the family of the victims who were killed in the Saturday’s untoward incident. “Condolences to the family of the young woman killed today, and best regards to all of those injured, in Charlottesville, Virginia. So sad!,” he tweeted. According to the police, they have arrested the driver who crashed the are into the crowd. They said that the incident wasn’t an accident as the driver after hitting the crowd once, took a reverse and accelerated towards more people gathered. “I am heartbroken that a life has been lost here. I urge all people of good will go home,” said Charlottesville Mayor Mike Singer. “The white nationalist demonstration in #Charlottesville is a reprehensible display of racism and hatred that has no place in our society,” tweeted Bernie Sanders‏. James Alex Fields Jr. 20, who has been identified as the driver of the Charlottesville car attack been charged with 1 count 2nd degree murder & other charges. Attorney General of the United States, Jeff Sessions has announced a federal terrorism investigation into the Charlottesville car terrorist, who could face a maximum of death penalty. The woman killed in the car crash has been identified as 32 year old Heather Heyer. Indian American lawmaker Ami Bera wrote on twitter that he is “appalled” by the situation in Virginia. “Appalled by hateful actions in #Charlottesville. We’re a great nation b/c of our diversity, not in spite of it,” Bera tweeted. Sen. Kamala Harris tweeted that what happened in Charlottesville is un-American and the whole of US should stand together to fight against such act of hatred and bigotry. “This is un-American. We must all stand against hatred and bigotry. Our unity is our strength and diversity is our power,” she tweeted.